(Nanowerk News) New modeling studies from Carnegie's Alan Boss demonstrate that most of the stars we see were formed when unstable clusters of newly formed protostars broke up. These protostars are born out of rotating clouds of dust and gas, which act as nurseries for star formation. Rare clusters of multiple protostars remain stable and mature into multi-star systems. The unstable ones will eject stars until they achieve stability and end up as single or binary stars. 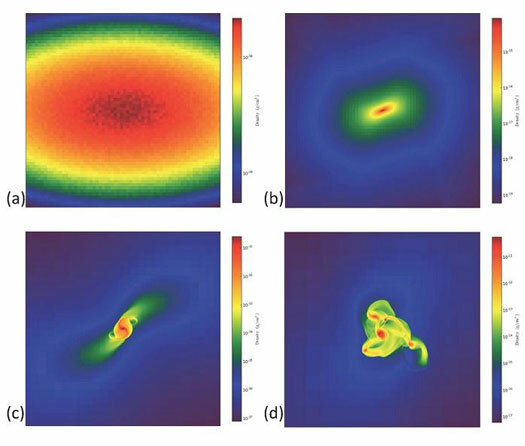 The work is published in The Astrophysical Journal. About two-thirds of all stars within 81 light years (25 parsecs) of Earth are binary or part of multi-star systems. Younger star and protostar populations have a higher frequency of multi-star systems than older ones, an observation that ties in with Boss' findings that many single-star systems start out as binary or multi-star systems from which stars are ejected to achieve stability. Protostar clusters are formed when the core of a molecular cloud collapses due to its own gravity and breaks up into pieces, a process called fragmentation. The physical forces involved in the collapse are subjects of great interest to scientists, because they can teach us about the life cycles of stars and how our own Sun may have been born. One force that affects collapse is the magnetic field that threads the clouds, potentially stifling the fragmentation process. Boss' work shows that when a cloud collapses, the fragmentation process depends on the initial strength of the magnetic field, which acts against the gravity that causes the collapse. Above a certain magnetic field strength, single protostars are formed, while below it, the cloud fragments into multiple protostars. This second scenario is evidently commonplace, given the large number of binary and multi-star systems, although single stars can form by this mechanism as well through ejection from a cluster. "When we look up at the night sky," Boss said, "the human eye is unable to see that binary stars are the rule, rather than the exception. These new calculations help to explain why binaries are so abundant."